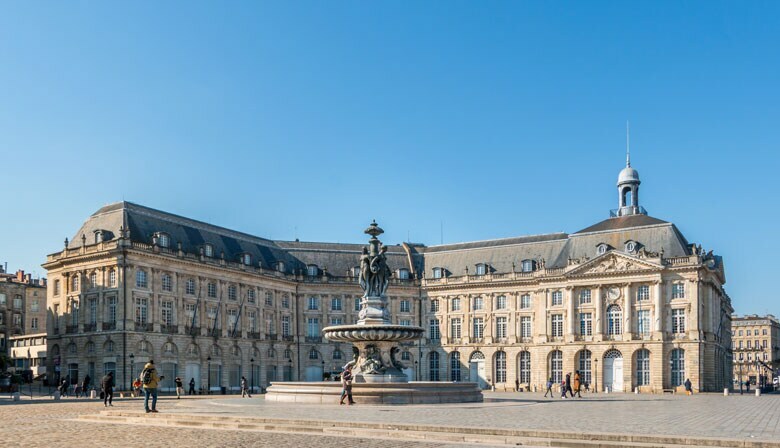 Use your stay in France to visit Bordeaux, considered one of the most beautiful European cities, accompanied by our professional driver-guide. You will see why Bordeaux living is good while strolling through the streets of the city center and leave to taste the famous wine of Saint-Emilion at a local winegrower. - Take the train from Paris to Bordeaux and from Bordeaux to Paris, meet our PARISCityVISION representative in Montparnasse train station at 6.30am in front of the Relay store at the main entrance of the station, Raoul Dautry exit. Our guide will welcome you directly on the platform at Saint Jean station in Bordeaux upon your arrival at 8.56am. - No transport from Paris. Meet your guide directly in front of the Bordeaux Tourist and Convention Office located in the center of the city at 8.15am. Depending on the chosen excursion, you will leave and return to Paris on the high-speed train, or you will find our guide directly in front of the Bordeaux Tourist and Convention Office located in the center of the city. The guide will first pick up people at the Bordeaux Tourist and Convention Office and then go to the train station to pickup people arriving from Paris. After discovering Saint Emilion, you will return to Bordeaux by minibus. After 45 minutes, your guide will invite you to lunch at one of the many restaurants located in the city center. You will have about an hour and a half of free time to eat and stroll a little in the streets. This guided tour will end around 4:30 PM, you will then have free time to stroll around at your leisure. If you have taken the option including the roundtrip trip from/to Paris, our guide will pick you up at 5.45pm at the Tourist and Convention Office of Bordeaux and accompany you by tram to the Saint Jean train station. You will then can catch the highspeed train to Paris that leaves at 6.34pm and arrives at Paris at 8.42pm. If you have taken the option departing from Bordeaux, our guide will let you continue your discovery of Bordeaux in complete freedom. You can then keep on visiting Bordeaux with a stroll along the quays where you will find a more peaceful atmosphere. You can also go to the Chartrons district, which is a very trendy place today. Its buildings show a cultural diversity that ranges from luxury shops to the Museum of Contemporary Art. A few steps away, you can spend your time visiting the City of Wine, easily accessible from the city center by tram. Pay attention on the two options possible: The first one includes no transport from/to Paris, the second one includes roundtrip transport by train from/to Paris. Departure from Bordeaux option: You will receive your confirmation and your voucher in 2 separate emails. Please print your voucher and redeem it to the our guide at the Tourism and Congress Office of Bordeaux.